, Ital. Colosseo, common name of the Flavian Amphitheater in Rome, near the southeast end of the Forum, between the Palatine and Esquiline hills. Begun by Vespasian, c.A.D. 75, and completed by his son Titus in A.D.
..... Click the link for more information. ), Verona, and Capua in Italy; at Nîmes and Arles in France; at Cirencester in England; and at sites in Sicily, Greece, and North Africa. The typical amphitheater was elliptical in shape, with seats, supported on vaults of masonry, rising in many tiers around an arena at the center; corridors and stairs facilitated the circulation of great throngs. The arena itself was usually built over the quarters for gladiators, wild animals, and storage. Until the erection of the Colosseum (A.D. 80), practically all amphitheaters were of wood, the notable exception being that of stone built at Pompeii c.70 B.C. The word amphitheater is now applied to modern structures which may bear little resemblance to their ancient prototypes. 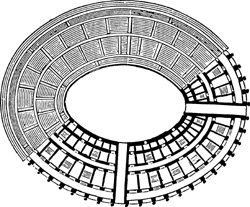 A circular, semicircular, or elliptical auditorium in which a central arena is surrounded by rising tiers of seats; originally for the exhibition of combat or other public events. A structure or large room containing oval, circular, or semicircular tiers of seats facing an open space. A valley or gulch having an oval or circular floor and formed by glacial action. 1. A circular, semicircular, or elliptical auditorium in which a central arena is surrounded by rising tiers of seats. 2. (Brit.) The first section of seats in the gallery of a theater. 3. Any outdoor theater, esp. of the classical Greek type. Students currently use the open grassy area proposed for the amphitheater, which is near the student center, for performing music. According to Borst, the Orchard Elementary amphitheater will be completed in mid-December. The substrate was thus uneven and amphitheater had to have regular service. The design look very similar to the current amphitheater, but changes include fewer pillar to improve sight lines, expanding the bowl with new seating, and improving accessibility, that will be ADA-compliant. PALMDALE -- Country singer Blake Shelton will perform Saturday in the Marie Kerr Park amphitheater to kick off the city's free summer park concerts. This summer, Caesars has brought back its "Concerts Under the Stars" series to the outdoor Roman Plaza amphitheater featuring performances by Peter Frampton, Jon Secada, Melissa Etheridge and Sammy Hagar. Tenders are invited for Concession Management Services Wolf Creek Amphitheater.